I haven't read a horoscope in ages, but Easter Monday's advice from Jonathan Cainer's 'Your Stars' in the Toronto Daily Star caught my attention. I'll share some of his guidance in 'out of context' excerpts without making references to any particular sign. "This week you should begin to feel as if you are waking from a long deep sleep...... Just be glad that now you can see the light." "Anger blocks love. Resentment blocks wisdom. Fear blocks hope. So if we want our lives to be full of love, wisdom and hope we need to take away the blocks.... when people are caught up in a negative response, they lose track of the obvious. All they can see are the reasons their feelings must be justified..... all it takes is a little forgiveness. Reach for love and wisdom now." 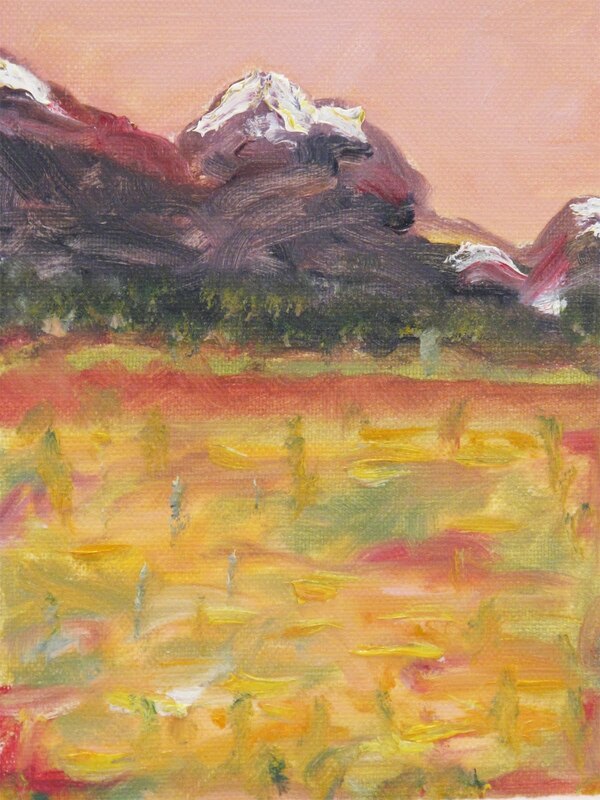 As for this old oil painting I found in the lost portfolio, it was inspired by the Rocky Mountains of Colorado. When you live at 8,ooo feet, you have incredible night skies that are absolutely filled with stars. It's entirely possible to walk up the mountain by moonlight. Check out the stars sometime... it elevates the spirits. Namaste.